FOR IMMEDIATE RELEASE- GREENSPRING MEDICAL AESTHETICS; aka Greenspring Rejuvenation Medical Aesthetics and Greenspring Oasis Medical Aesthetics AWARDED DIAMOND AWARD FOR COOLSCULPTING®. FOR IMMEDIATE RELEASE- GREENSPRING MEDICAL AESTHETICS IN TUCSON, ARIZONA NAMED AS PREMIER TOP 50 ALLERGAN PRACTICE FOR US. 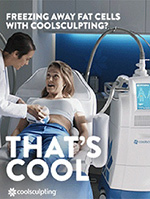 Coolsculpt DualSculpting at Greenspring – Freeze the Fat! We treat the best, because we have the best. What Do You Have to Gain from a VISIA Skin Analysis?